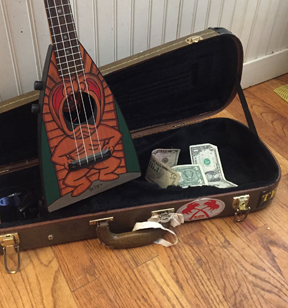 Another odd shaped instrument from Ancil Swagerty. Bottom edge of body says: SWAGERTY Specialties Company, Artistry In Woods, Design Manufacture San Clemente California. Although the tip of the peghead to the bottom of the body might be long enough to be a "Little guitar" (27 inches), Its scale (nut to bridge) seems that of a Ukulele. It would not seem far reach to assume the molded fretboard is the same one they used on the "Kooky Uke" line.